Self-Study — Your Road to the MCSE? 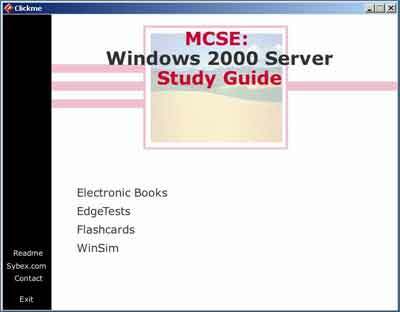 Consider Sybex’s Windows 2000 self-study materials a good place to start learning Win2K basics. Just don’t expect them to be the end-all, be-all. What best describes your certification situation? Are you a Windows NT MCP or MCSE looking to upgrade your certification to Windows 2000? Or are you pursuing your first certification credentials? Whatever your situation, you may have already decided self-study is your preferred exam-preparation method. With numerous self-study materials to choose from, it’s important you do your homework before investing your hard-earned time and money. To help you in this decision, let’s take a close look at Sybex’s Windows 2000 MCSE core exam-preparation materials, which are made up of two self-study components: study guides and exam notes. Each study guide starts with a 30- to 35-question assessment exam. This assessment’s purpose isn’t really made clear; I assume it’s meant to see what you know about Win2K and to determine if the study guide is above or below your expertise level. The chapters in each guide follow a common format, starting with an overview of the exam objectives. The technical lecture that follows is intermingled with hands-on practice exercises. These exercises are short and simple, walking you through installation or configuration of a Win2K feature. I found these exercises suited their purpose. The chapters end with a set of review questions that are adequate for testing the reader on concepts just covered. At the end of each guide you also find a longer practice exam. When you turn to the exam notes, you see that they essentially follow the same format as the guides, except that small subsections titled, “Critical Information,” “Necessary Procedures” and “Exam Essentials,” are inserted throughout the notes, supposedly to give you more exam insight. Technical content for the study guides and exam notes is designed for entry-level Win2K techs and is fairly easy to follow. Keep in mind, though, that the Win2K MCSE exams aren’t designed for entry-level personnel — passing the exams demands an in-depth understanding of Win2K. As I leafed through the study guides and exam notes, I did encounter some shortcomings. Among these were uneven coverage of exam objectives, content duplication between the guides and exam notes, and sketchy technical editing. In one instance, the Win2K Server guide covers NT 4.0 System Policies in tremendous detail yet neglects to cover in sufficient detail the inner workings of Win2K Group Policy. In another chapter, IIS 5.0 is thoroughly explained while relatively little attention is paid to how Remote Access Policies are evaluated and applied. In addition, it presents little detailed information on the Encrypting File System and how it works. Rather, the guide generically describes the mechanics of encrypting files without explaining the theory. Technical content overlaps to a great extent as well. For instance, the Win2K Professional and Server guides duplicate so much material that Sybex easily could have consolidated them, similar to the way Microsoft consolidates the same subjects in the Microsoft Official Curriculum. There’s also overlap of material between the study guides and exam notes; I’m not sure why you’d purchase both. The “extra” exam tips provided by the exam notes are nothing to speak of and should have been incorporated into the study guides. Each Sybex Study Guide companion CD-ROM contains an electronic version of the guide and practice exams, plus multimedia content. For both the guides and exam notes, the technical editing is, in a word, inconsistent. Some of the materials exhibit relatively few technical errors while others are riddled with glaring mistakes. For example, I discovered the following in the Win2K Professional Exam Notes: “Basic storage consists of primary and extended partitions. The first partition that is created on a hard drive is called a primary partition. The primary partition uses all of the space that is allocated to the partition. Each physical drive can have only one primary partition. Subsequent partitions are called extended partitions. … You can have up to three extended partitions on a physical disk.” These statements are incorrect. A basic drive can have up to four partitions, with three of them primary and one extended. Ironically, while the exam notes incorrectly describe basic disk partitioning, the same concept is explained correctly in the accompanying study guide. Here’s another mistake from the Win2K Professional Exam Notes: “You cannot create basic storage through Windows 2000. Basic storage only exists if you have upgraded the computer from a previous version of Windows NT to Windows 2000.” These statements aren’t true, as basic storage is the default storage type for all Win2K boxes. It doesn’t matter if these computers have been upgraded from a previous OS or installed from scratch. Because of the content overlap, many of the technical errors that show up in the study guides are present in the exam notes as well. While technical errors do appear in most technical books — and yes, Sybex posts errata sheets on its Web site — there’s still no excuse for letting these blatant technical mistakes slip through the editing process. Each study guide comes with a companion CD-ROM, where you find the corresponding guide in Adobe’s .pdf format, along with electronic versions of the assessments, end-of-chapter reviews and final exams found in the print guides. There’s also a flashcard exam-prep product on each CD-ROM that can be viewed on your computer or downloaded to a PDA. The above tests and flash cards are adequate as post-chapter learning assessment tools, but they’re not at all suitable for real exam preparation. In terms of content and depth, they’re nowhere near the quality of some of the practice exam products, such as those made by Transcender and Self Test Software, that I’ve reviewed in recent months. The CD-ROMs also boast something called WINSIM, which consists of various movies that show you how to perform Win2K tasks. I found these movies to be narrated wizard walkthroughs that you could probably better perform on your own. The Sybex materials are a good place to start learning Win2K basics. But, as I’ve already pointed out, by no means should you consider them the end-all, be-all Win2K exam-prep materials of your dreams. And if you do purchase the study guides, then I don’t recommend purchasing the exam notes, since much of the content is duplicated. If you use these materials, make sure you download the latest errata sheets at www.sybex.com. In the meantime, stay tuned to this column, because when I do find the perfect MCSE exam-prep self-study materials, I’ll let you know right away.